Figure 5.1. Electron micrograph of the 70S ribosomes isolated from Escherichia coli. 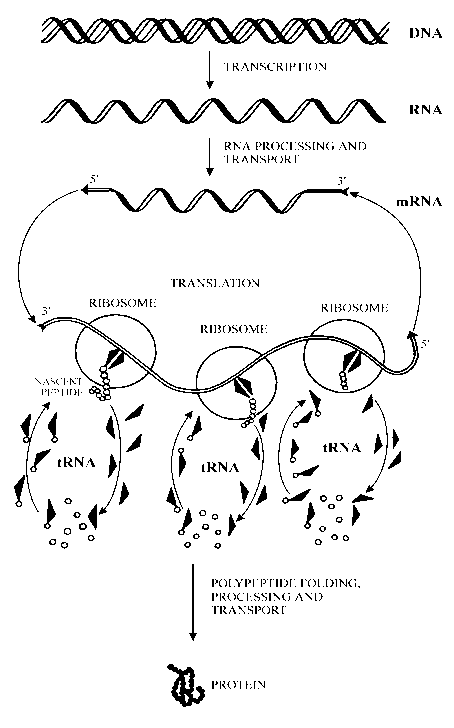 To achieve the contrast necessary for the particles to be seen in the electron microscope, the isolated 70S ribosomes are applied on an ultra-thin carbon film; the film with attached particles is treated by uranyl acetate solution and dried in air. The particles become embedded in uranyl acetate that fills cavities and grooves. The ribosomal particles having lower electron density than uranyl acetate appear negatively stained against the background of uranyl acetate. The arrows indicate the L7/L12 stalk described in the text. (Original photo by V. D. Vasiliev).